The overwhelming majority of Bluetooth audio tech is reserved for awesome Bluetooth speakers. That mobility and freedom offers a value lots of people can’t find elsewhere. Drivers are in the same boat. Older cars have older factory decks, and depending on how far back you go, chances are you won’t find Bluetooth compatibility. Instead of investing in a $100 Bluetooth speaker that would sit on your dash, why not utilize the speakers already in your car? Only thing you are going to need for this is a Bluetooth car kit, which is exactly what we’re going to talk about today. A low profile, stylish design that is pretty subtle. Comes with a great set of features including advanced ones. Great quality of connection with no interruptions. Built in car locator feature can be handy. Its minimalist design limits its versatility to a point. Anker is one of the few companies who can claim that they offer affordable yet reliable tech. As a matter of fact, the cover anything from battery packs to solar panels to Bluetooth receivers. Speaking of which, we wanted to show you the Anker Roav SmartCharge F2 Bluetooth Receiver. It is an awesome piece of kit that’s worth checking out. Despite its very simple design which is built around the lighter plug, this is one of the more reliable devices of this type on the market. It comes with a fairly simple set of controls, dual USB ports and a whole lot of other cool features. Dialing in the frequency is very easy thanks to the built in LCD display. A more hands on device which offers plenty of control. Stylish design makes it a fairly attractive piece of tech. Good and reliable connection at all times. Fully adjustable in terms of positioning. Not the most compact transmitter out there. There are several standardized designs when it comes to Bluetooth FM transmitters. 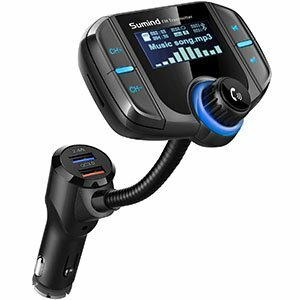 The one that Sumind Bluetooth FM Transmitter uses is probably among the more popular ones. It is a really great choice for those want a more hands-on experience and more control over their devices. With that said, it is a super easy device to use all things considered. What makes it so practical is its large LCD display which is stems from the lighter adapter plug. The display itself is surrounded by simple to use controls which comprise of a set of buttons and a single control wheel. AT the base of the device you will also find two USB ports. Overall, the features and performance is great. One of the most reliable models on the market. Fully adjustable design which allows for plenty of flexibility. Comes with simple controls and a large display. Great quality of connection as well as sound. Not the prettiest model on the market at this point. Up until recently, Nulaxy was the dominant brand in this segment of the market. Their transmitters were simply considered superior in many ways to the competition. In reality, Nulaxy was delivering that reliability which everyone was and is looking for. 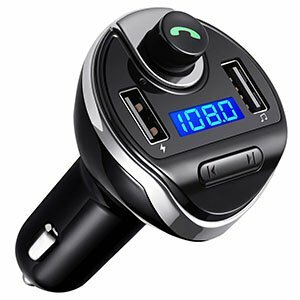 Nulaxy Wireless In-Car Bluetooth FM Transmitter is one of the models which is responsible for this reputation. It’s still impressive. Much like many other transmitters out there, this Nulaxy model uses the flexible design. Display and all of the controls are connected to the lighter adapter via an adjustable neck. 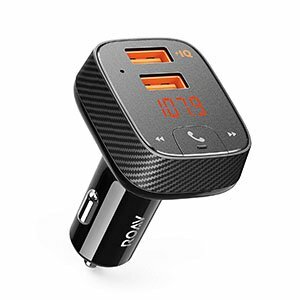 With simple controls, a large display and a very good quality of connection, Nulaxy Wireless In-Car Bluetooth FM Transmitter definitely delivers a great bang for the buck that’s for sure. A simple yet reliable device to have. Great quality of sound with good connection. Features two USB ports meant for charging. A pretty standard looking transmitter. VicTsing is a brand that much like Nulaxy has managed to establish their foothold on the market. T Heir designs are followed by a pretty good reputation. 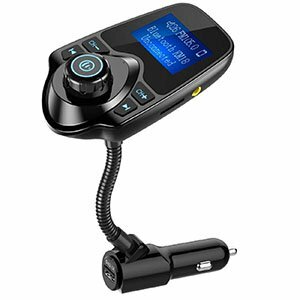 VicTsing FM Transmitter is a model that shares its design with a number of different transmitters on the market. Even so, it is somewhat unique in terms of sound, reliability and overall performance. The design which includes a head unit mounted on a flexible neck is not the most compact one, but it is definitely among the most functional ones. The display is large, controls are easy to use and simple, all of which makes this transmitter a great piece of kit to have. On top of that, the sound is on point. A rather unique type of receiver which fills a niche. Compact device that is lightweight and easy to use. Can work on other devices such as headphones or speakers. Fast pairing and wide compatibility. The quality of could could have been better. 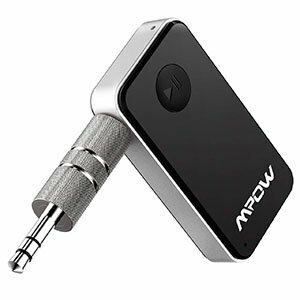 What Mpow Bluetooth Receiver offers is something completely different. It is a Bluetooth receiver that can be used in your car, but also on your headphones, speakers and just about anything that plays music and accepts the 3.5mm plug. Compared to most other devices in this category, it is different to say the least. Even so, it’s quite practical. The idea behind this device is to offer an easier way to pair your device with your car’s built in system. The way you do this is by plugging the device into your car’s 3.5mm audio input. From then on, you can stream music from your phone, manage calls and more. The battery will last you some 10 hours. A simple and straight forward design. Light device that doesn't take much space. Great sound quality and very reliable connection. Pairs up in a matter of seconds. Display, although practical isn't always easy to read. 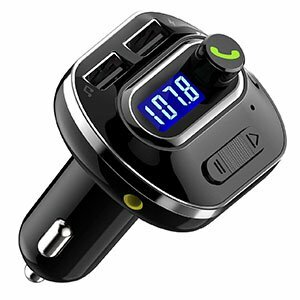 In case you are looking for a standard transmitter/receiver which doesn’t take a lot of space, something like Imden Bluetooth FM Transmitter might be the answer. This particular model is not all that unique when it comes to design and features. However, it’s by far one of the most reliable devices of its kind you can get right now. The entire device is centered around the tiny display set between two USB ports and a set of controls mounted on the side of the housing. It’s extremely easy to use, fast to pair with your devices and pretty reliable. The sound quality is more than good while the connection stays strong. It’s a great choice, especially at this price. A more advanced version of a standard design. Good visibility of the display and controls. Easy to use on the go. Offers solid performance and good reliability of connection. One thing that we can appreciate about VicTsing is their sense for problem solving. Where most other brands in this industry simply take the standardized design and slap their logo on it, VicTsing went on to improve upon it. 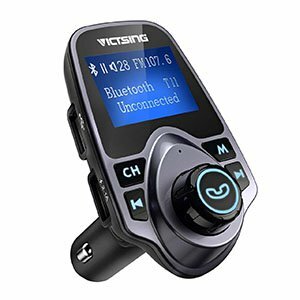 VicTsing V4.1 Bluetooth FM Transmitter may not seem like much, but it offers a much better design and experience. The main reason why this model is so much better than most of its competitors is the fact that its display offers good contrast even in light conditions. On top of that, the controls are mounted on the top and not the sides of the device. When it comes to performance, it is one of the more reliable models available. A pretty good looking transmitter compared to most. Comes with a high contrast display which is always great. Features simple controls and two USB ports. Good quality of sound and connection. That bottom control button isn't very visible in the dark. Much like VicTsing, Criacr has decided to improve the standardized design found on most FM transmitters. The main difference between these two brand’s approach comes down to aesthetics. 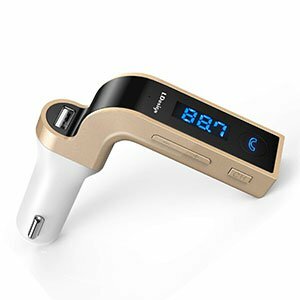 Ciracr Bluetooth FM Transmitter is more aesthetically pleasing. Overall it is a reliable transmitter that pairs well with just about any device. On top of that, it is also cheaper than most. The features it offers are pretty straight forward. You have the two USB ports, one for charging and one for streaming music. The display is visible enough in all light conditions thanks to its high contrast. Above it, you’ll find a control knob used to answer calls and set frequencies. The overall sound is great as is the connection quality. A unique design which is quite refreshing. Comes with an easy to read display. Simple controls are always a plus. Decently reliable connection and good sound quality. Its design may not work in all cars. Speaking of unique looking transmitters, we have to mention the LDesign Wireless in-Car FM Radio Adapter. This model comes with a unique design which makes it good looking. However, due to the way the main control surface extends at a 90 angle compared to the lighter adapter, you might run into issues with fit. Naturally, this depends on your car. If you can get over that, you are left with a solid performer which comes at an affordable price. The controls are mounted on the side of the chassis while there is one button at the top near the display. Speaking of which, the display is pretty easy to read no matter what. Additionally, you also get one USB port. How To Choose The Best Bluetooth Car Kit For Your Needs? Bluetooth car kits used to be divided into two main categories – those designed specifically for music and those meant to function as a hands free device. Most of the modern ones combine these two functions into one. A lot more relevant classification today would be how they are powered, and how they send audio from your phone to your car’s audio head. In this regard, you have two options as well. There is the old school FM transmitter and a more modern, 3.5mm AUX enabled line of receivers. The main difference between the two is in reliability. Old school Bluetooth receivers tend to suffer from interference as they are using an existing radio frequency to stream music. Sometimes you won’t have a single problem, other times interference will be unbearable. Modern AUX cable Bluetooth car kits don’t have that issue. However, they do have limitations of their own. For starters, what if your built in stereo, or that old Pioneer cassette deck doesn’t have an AUX in? Because of all that was stated above, you should definitely make sure that you know exactly what your deck supports. Otherwise, you will end up disappointed and running a $50 Bluetooth speaker in the back seat. Another thing to keep in mind is the power source for the Bluetooth car kit. If it is powered by that standard cigarette lighter port, you need to figure out what format of the car kit fits your center console. Some brands like to put their cigarette lighters right out there in the open while some tuck them in some pretty cramped spaces. If the latter is the case, a lot of those uni body Bluetooth car kits with massive displays won’t work. This doesn’t mean you are out of options, but rather that you should pay attention to what will work with your particular car. 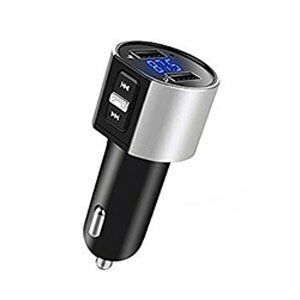 The best thing about Bluetooth car kits is that you can essentially bridge the technological gap between modern standards and older audio engineering. The ones we have shown you above are about as good as it gets at the moment. Not only are most of them really affordable, but investing into a device such as this one instead of a modern radio head, can really save you a whole lot of money. In the end, if your old deck is still working great as some of them absolutely do, a Bluetooth car kit can bring it into the new age.